I figured I needed to invest some time in catching up on some of my comic book related reviews - it also gives me time to finish some of the more complex novels that I'm in the middle of reading. 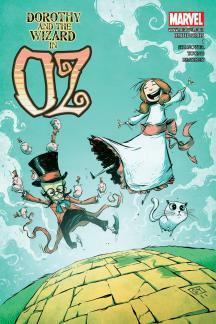 And one of the comic book series that I've enjoyed quite a lot are the various Oz adaptations released by Marvel Comics. And while they've finally ended this project of sorts (so sad!) that still leaves us with a few more adaptations to discuss. Dorothy and the Wizard in Oz is the fourth such graphic novel adaptation of the popular Oz books following their original cycle of release. And admittedly it's not quite a story I was totally familiar with off the top of my head - there are significant gaps in my Oz knowledge, I'm afraid. Thus these Marvel Comics releases have been interesting little adventures in the Land of Oz, at least for me. 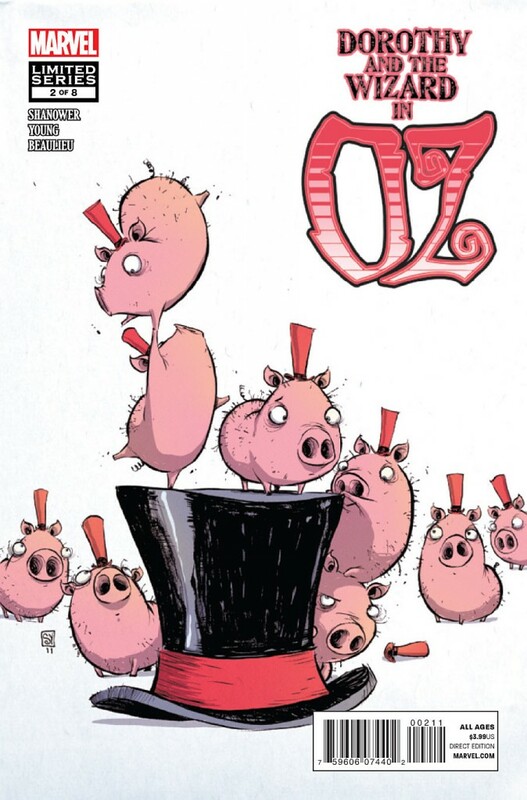 But more than anything else, I love these comics because of Skottie Young's brilliant, playful art style that so perfectly captures the land of Oz. Who cares if the stories are a tad simplistic given the time they were written and the major fact that they target children. Everything just comes together nicely in these books and I'm glad that they exist, even if only for a select number of Oz adventures. Synopsis: Dorothy and the Wizard in Oz is the Marvel Comics adaptation of the L.Frank Baum children's novel of the same name. It was adapted by Eric Shanower with art by Skottie Young. The story pretty much begins when Dorothy Gale, her kitten Eureka, her cousin Zeb, and Zeb's horse Jim fall into some earthquake-created crevice that drops them straight in the land of the Mangaboos. The Mangaboos are a race of vegetable people, who pretty much blame Dorothy and her companions for the falling rocks from the earthquake. Given the vegetable people and the fact that both Eureka and Jim are now able to talk, Dorothy quickly determines must somehow in a fairy realm that's a distant part of Oz. And to complete the party comes the Wizard in his hot air balloon pretty much dropping out of nowhere. Given their vegetable nature, the Mangaboos threaten to punish the intruders with a rather fatal punishment. But the Wizard manages to convince them to wager their lives in a contest of magic - something that rather scares Dorothy given she knows the Wizard to be a bit of a humbug. Plus all the Wizard seems to have up his sleeves are 9 little piglets that don't seem all that magical on their own. Should they escape the land of the Mangaboos, there's still the greater challenge of getting out of this underground realm and back to the Oz that they know and love. Allow me to first take a moment to once again gush over Skottie Young's adorable art style and how well it fits into the world of Oz. As much as I totally love and respect the original art that went into the L. Frank Baum books, there's just something about Young's detailed yet erratic way of drawing characters that just feels so Ozian to me. And do you see those little piglets on the side right there? Too adorable for words! I cannot get over those piglets! And while I can see how not everyone may appreciate his art as I do, at the very least you have to admit that it really works in this theme. It may not be everyone's fare when it comes to the big superhero books, but it work's just fine with a cute little piglet. This story, like many of the early Oz books, generally follows the typical format of our human friends finding themselves back in Oz due to rather odd circumstances and them going on adventures as they travel through the Land of Oz. You can see how they truly are children's stories of a different age given how they dance between the narrative flow of short stories or just children's books in general. The lack of a central plot beyond the typical journey home has to be excused for the most part as Baum's favored literary device - they at least make for a consistent reading experience. But beyond the rather flimsy overall plot, this adventure into Oz does feature some interesting characters. The Mangaboos end up being one of the more important ones given how they dominate the beginning of this story. And their strange vegetable nature does provide for some interesting ideas for the young (or young at heart). I also liked the silly notion of the invisible people with their invisible bears and our poor little invisible piglets. A cute piglet isn't quite as cute when you can't see them. The team of Shanower and Young certain have figured out how to consistently bring to life their version of the Land of Oz that makes for some rather beautiful books. It's only a shame that they won't have the opportunity to adapt all of the Oz books into comics for some reason I've yet to discern. Dorothy and the Wizard of Oz may not be my favorite of the Oz stories given it's rather crazy story flow and decent but not always brilliant characters, but it's still a fair amount of fun. And as a comic book, it does make for a rather lovely visual experience. Thus the title gets 3.5 invisible yet still adorable piglets out of a possible 5.